The baked apples alone...they are the tastiest baked apples I've ever eaten! 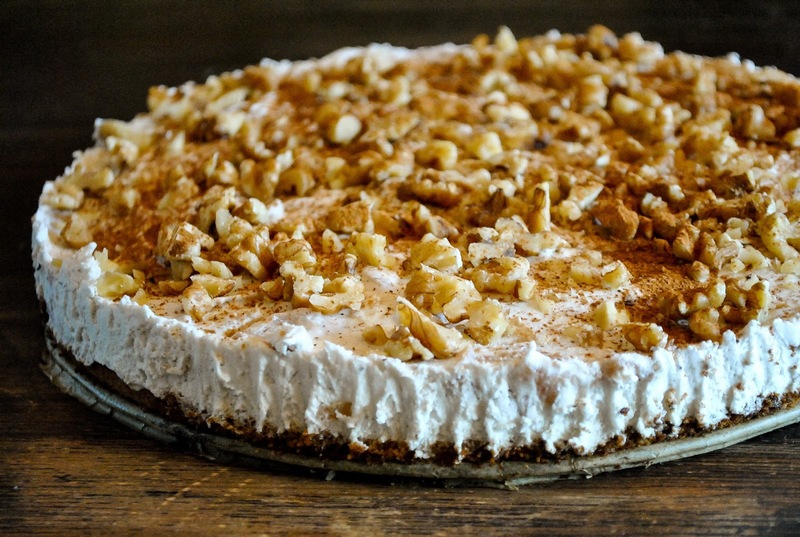 But when sugary and cinnamony apples are mixed into creamy coconut whip and topped with walnuts? And it's all on a gluten free cake that doesn't need any special and expensive ingredients? I don't know about you, but it sounds pretty fabulous. And it is! 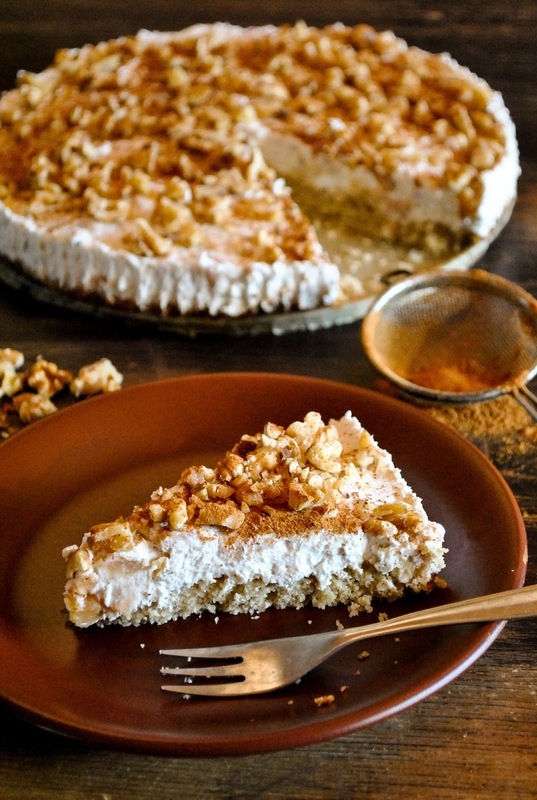 This cake is so decadent, creamy and fruity but yet so easy to make. It just needs some time to set in the fridge, so it's best to make it an evening before. Just imagine a Sunday brunch with this luscious dessert. Or any breakfast, lunch or dinner of the week. It will be perfect all year round. I also think it would be great as an Easter dessert. Happy baking and let me know how you liked it! Preheat the oven to 350 F / 180 C. Mix oat flour with baking powder and salt. In another bowl, whisk sugar with oil, water and vinegar. Set aside until the oven is heating. In the meantime, peel the apples and cut them into four. Remove the core pieces. Place the apples into a loaf pan covered with parchment paper. 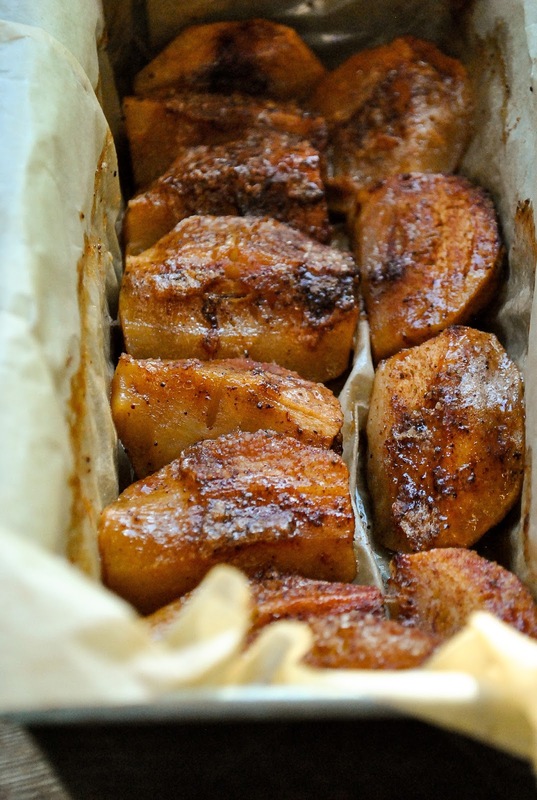 Mix sugar with cinnamon and sprinkle the mixture onto the apples. Set aside. 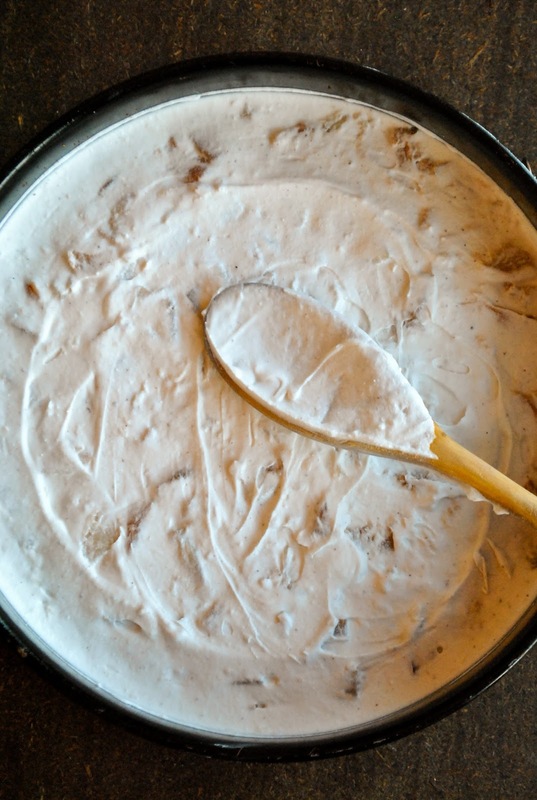 When the oven has reached its temperature, grease a round cake pan, mix the dry and wet ingredients and pour the batter in. 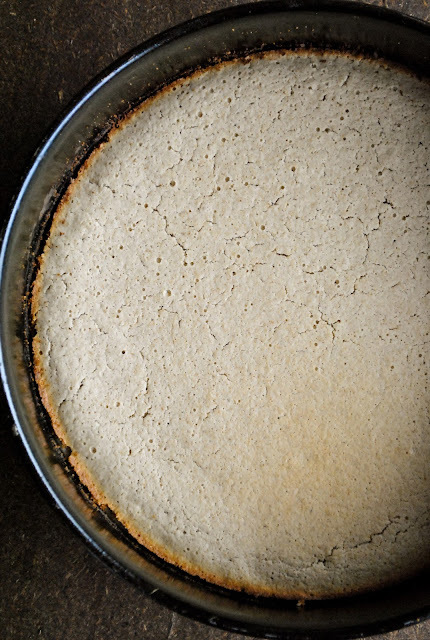 Tilt the pan, so the batter covers the pan evenly. Place the cake and the apples into the oven at the same time. Bake the cake for 18 minutes and the apples for 30 minutes total. Cool down the cake and the apples. Take the coconut milk cans out of the fridge. Flip them upside down and open them. Pour away the liquid (or keep it for some smoothies, cocktails or curry) and scoop coconut cream into a bowl. Add powdered sugar and whip for a minute or two. Cut the cooled apples into cubes and mix them with the coconut whip. 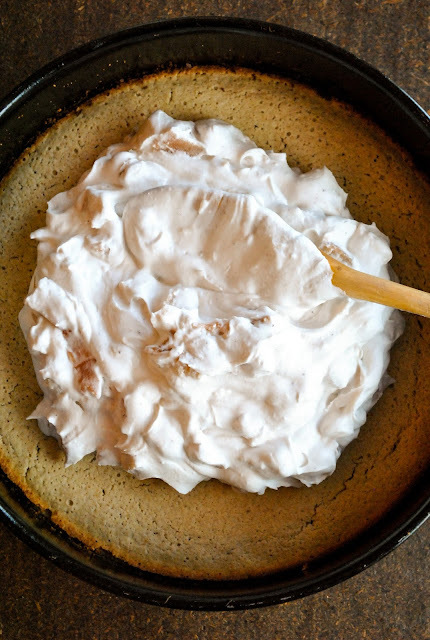 Pour the apple and whip mixture onto the cooled cake and spread it evenly. 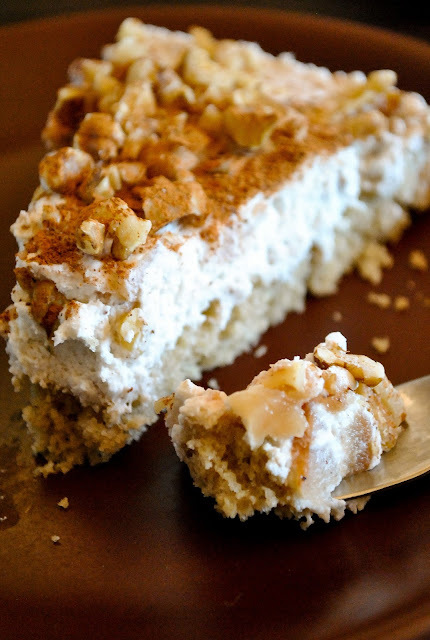 Sprinkle some chopped walnuts on top and put the cake into the fridge for a few hours or over night. Before serving, sprinkle some cinnamon on top.